Missing VLANs - CCNA Academy-a Free CCNA Tutorials. Study CCNA for free! In this article, we will analyze the missing VLANs, we will take a brief discussion about the missing VLANs. The last article addresses the problems of IP addressing with VLANs. Step 1. 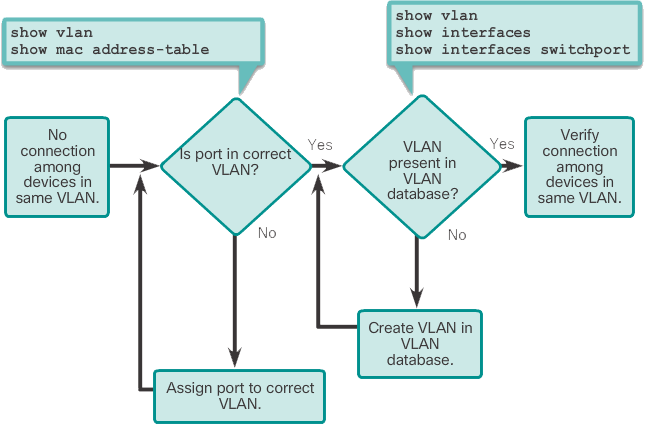 Use the show vlan command to verify that the port belongs to the expected VLAN. If the port is assigned to the wrong VLAN, correct the VLAN membership with the switchport access vlan command. Use the show mac address-table command to verify which addresses have been learned on a particular port on the switch and to which VLAN that port is assigned. Step 2. If the VLAN to which the port is assigned is deleted, the port is deactivated. The ports of a deleted VLAN are not listed in the output of the show vlan command. Use the showport switchport command to verify that the inactive VLAN is assigned to the port. The MAC addresses learned at the F0 / 1 interface. You can see that the MAC address 000c.296a.a21c was learned at the F0 / 1 interface on VLAN 10. If this number is not the expected VLAN number, change the VLAN membership of the port with the switchport access vlan command. Each port on a switch belongs to a VLAN. When the VLAN to which the port belongs is removed, the port becomes inactive. All ports that belong to the deleted VLAN can not communicate with the rest of the network. Use the show interface f0 / 1 switchport command to verify that the port is inactive. If the port is inactive, it will not work until the missing VLAN is created with the global configuration command vlan vlan-id or the VLAN is removed from the port with the no vport-vlan-id switchport access command.